I recently saw a video from Geek Beat TV that included some great options for crews on long deployments in the field. Do you drive for hours to get to your field locations? Do you spend 8-10 days in the field at a time? Do you spend that time camping? If you work in the West then chances are the answer is yes. The first device, a road safety light, is applicable to all situations. If you have a field vehicle then you should have something like this. The latter devices are for people and companies that have embraced a digital lifestyle. The Video from Geek Beet called, “My Mobile Life Episode #116” is below. Check it out, then read on. If the video doesn’t load you can find it here. A couple years ago my wife, also an archaeologist at the time, and I were returning to the office in a company vehicle when the left rear tire blew out on the interstate, in the dark, in the middle of a torrential down pour. Good times. There was just enough space to pull off the interstate and be safe while changing the tire. It would have been real handy to have the Eton Road Torq in our safety kit. Ever have to get into something in the company safety kit only to find out that the batteries are dead, or, something is expired. Well, that’s why it’d be nice to have one of these devices. The Road Torq can be hand-charged with the side hand crank so you know it will always work. Just two minutes of cranking will give it ten minutes of flashlight and flashing beacon power. You can also charge it up prior to leaving with the DC input for extra long charges. Well, that’s why it’d be nice to have one of these devices. The Road Torq can be hand-charged with the side hand crank so you know it will always work. Just two minutes of cranking will give it ten minutes of flashlight and flashing beacon power. You can also charge it up prior to leaving with the DC input for extra long charges. The Road Torq stands up with three reflective legs and has a three-LED flashing beacon and a bright, LED, flashlight. At less than a pound (13.7 oz.) this device is a must for any company, or personal, road safety kit. I discussed two other field battery packs before here and here. There is a suite of battery packs from this company that should fit most smartphone and tablet needs. The advantage to these power packs, as opposed to the Zagg Sparq and the Solio Bolt, is that they contain their own charging cords. Not all of them do, but some. The Peak 6000, Summit 3000, and Portable Power Bank 6000 all contain charging and power cords which eliminates the need to carry extra cords. I’ve often found myself with one of my two battery packs but without a sync cord required to charge my device. That makes my power packs just extra weight. Get a myCharge Power Pack and you won’t have that problem. Now we’re in the big leagues. 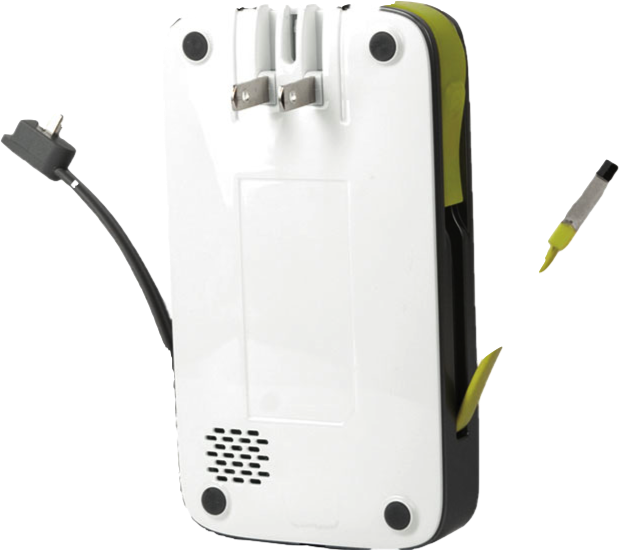 The HyperJuice series are a group of batteries that allow you to charge a laptop and two other devices, such as an iPhone and an iPad, many times over. The HyperJuice 2 will run a MacBook for up to 18 hours, an iPad for 34 hours, and the iPhone can be charged up to 19 times. I’ve been on long camping trips for work and it was essential to use a laptop in the evening to download equipment. For hours on end the field supervisor had a gas generator running.and it was very annoying. If we only had to run it once every other day that would have been better. With these batteries you wouldn’t have to run the generator every day and that alone is worth it. The devices I’ve presented here have many uses. They are also only a few options among many on the market. When spending the amount of money that some of these things cost I highly suggest you figure out what your needs are and find something that suits them. It is easy to under or overestimate what your needs are. My inclination is to always overestimate what my needs are and get something that’s a little beyond what I currently need. That way I’m prepared for the inevitable upgrade cycle and my equipment will stay relevant for a little while longer. What fun and useful tech do you use in the field? Leave a comment and let my readers and I know so we can all benefit from our collective knowledge and experience.